It’s been 10 minutes since I learned about Luke Perry’s death and I have not been able to stop crying. Its weird how celebrities can gain entry into our deepest emotions, that when we lose them its like losing a member of your family. I always knew of Luke’s work from 90210 but having not been the right age for that show it never came into my watching ethos, but I always saw Luke on other things. It was always nice to know that Luke was a genuine person. He didn’t let his teen fame make him someone who was fake and superficial. Luke really entered my thoughts on a show called Riverdale. He played Fred Andrews, father of Archie Andrews, and the BEST DAMN parent on the show. Watching Luke play Mr. Andrews really spoke to me on not just a son level, but a father level as well. Fred cared for nothing more than Archie’s well-being. He never put himself before Archie, even if that meant letting Archie be a spoiled, rotten, brat. He made me appreciative of my own father. I saw much of both my father and myself in Fred, and I on more than one occasion told myself that he was the father I hoped to be. Surrounded by teen angst, and melodrama, here was a character who was pure, of good moral standing, and a caring individual who took homeless gang members into his home and cared for them when the whole city had turned their back on them. Many times, we see actors portray different characters, from good to evil, loving to hated, but there was a real part of Luke Perry that had entered the part of Fred Andrews. It is with a saddened heart that I have to say goodbye to you. Goodbye, Mr Andrews, and Rest in Love and Peace, Luke Perry. “Stan & Ollie” follows Laurel and Hardy, Steve Coogan as Stan Laurel and an almost unrecognizable John C. Reilly as Oliver Hardy, as they tour through post-war Britain and Ireland. The purpose for the tour was to reignite their film career, but this time overseas ended up being their swan song as performers. This film is directed by Jon S. Baird, who recently directed the film “Filth” and was written by Jeff Pope, who wrote the 2013 movie “Philomena”. “Stan & Ollie” does not have a set North American release date, but from the looks of the trailer, this movie will make a lot of noise when it hits the silver screen. NowhereCalifornia.com Reaches Its First Year.. It started one year ago today, this site was launched and took the concept of Nowhere California to a whole new level. Nowhere California started in 2011 and it was just another conversation between two friends, but these conversation started taking place in front of a microphone and unleashed on the internet. It was as simple as that, but as Nowhere California evolved, the team grew and new accomplishments were reach. The episodes started to grow and the team ventured out of the Nowhere city limits, as they dove into the world of conventions and conducting interviews. It was with each accomplishment, the Nowhere California family stuck to their ideals of what they wanted to produce and not to become just another podcast. It was that mindset that grew into this website and, as we mark our first year on the net, we want to simply say THANK YOU. Thank you for following the journey of Nowhere California. Thank you for listening to the original podcast and all of the other podcast that have sprung from this little idea. And thank you for continuing this adventure with us. In the past, Nowhere California has had the opportunity to talk with some insanely talented people and this streak has continued with this our conversation with Chantel Riley. Chantel can be seen currently on Broadway as Nala in “The Lion King”, a role she had the opportunity to play in a production based in Germany. Also, the world can now see Chantel’s performance as Quincella in the movie “RACE”. “RACE” delves into Jesse Owens’ journey to the 1936 Olympic Games, these games took place in Berlin and we relive Owens history making face off against the handpicked athletes of Adolf Hitler. In the events leading to the Olympics, we learn about Jesse’s life and loves, this is where Quincella enters the picture. Quincella was a well-off admirer of Owens and pursued the athlete like an Olympic medal. As in any role, there is a unique road to the character and the same goes with the career of any performer. It was a pleasure to talk with Chantel and you can CLICK HERE To Listen To Our Conversation Now. During this conversation, Chantel mentions an animated telling of her career and here is the first episode of that series for you viewing pleasure..
Why Not #19 – Why Not One Hour Photo? The guys from Nowhere have been celebrating the life and career of the legendary Robin Williams through special episodes of “Why Not?” The “Why Not?” episodes of Nowhere California started out as a way to have a monthly movie discussion and spotlight movies that might have flown under some radars. In the past installments of “Why Not?” the Nowhere California Team have focused on movies that slightly fell out of the mainstream to movies that a regular viewer might have not given a proper chance. There are many other ways to describe these movie, but the goal of “Why Not?” is to give these films another shot. 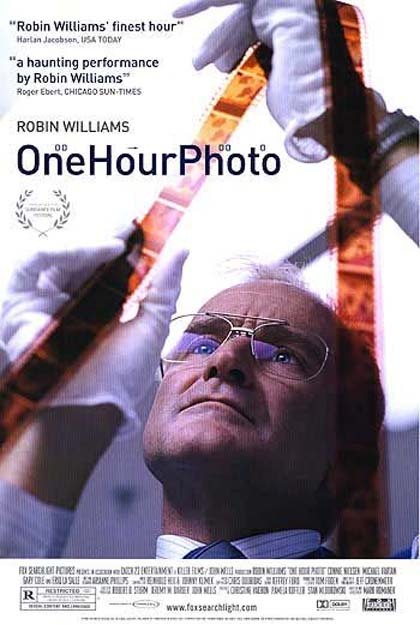 Click Here To Listen To Why Not #19-Why Not One Hour Photo? A Look From Nowhere A “Death In The Desert”..
Las Vegas has multiple names and Sin City is one of the most notorious labels for this desert city. In a 24 hour world of any vice imaginable, the darkest stories are never too hard to find and one of these stories has made its world premiere at the Tucson Festival of Films. 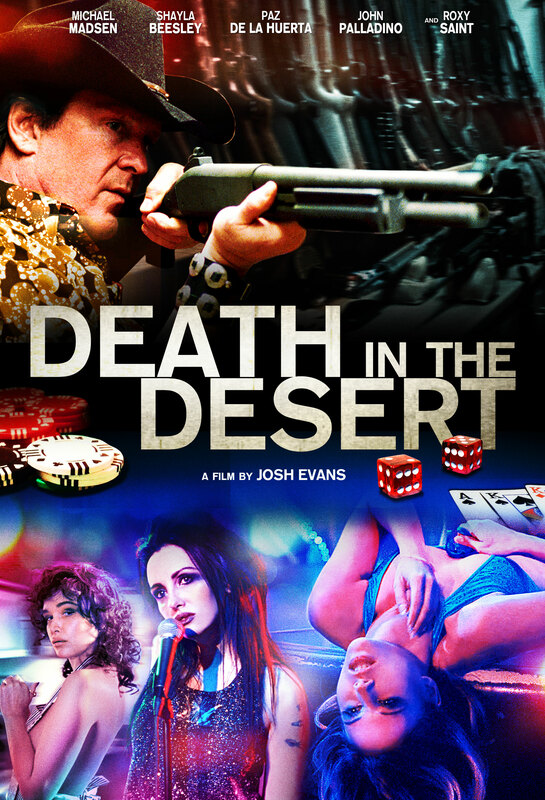 The film is “Death In The Desert” and revolves around a darkly dysfunctional love triangle. Kim Davis, who is played by Shayla Beesley, becomes the live-in girlfriend of Ray Easler. Easler, who is played by Michael Madsen, is a legendary casino owner and he lives a drugged fueled Vegas life, with that mix Easler a rash decision to bury $20 million dollars in silver in the middle of the Nevada desert. As this is a difficult task, Easler hires on some help and this help comes in the form of Matt Duvall. Duvall, who is played by John Palladino, catches the eye of Kim and with that final piece, a perfect storm of destruction is unleashed. As you can tell from this extended trailer, this film is deserving of the critical acclaim and will be an intense trip into the world of true crime. “Death In The Desert” is based on the book written by Cathy Scott and was directed by Josh Evans, with John Steppling adapting this story for the big screen. Type casting is sort of a duel edged situation, for performers it can guarantee work and a long life in Hollywood. Also, type casting can become very stale and most performers can get lost in the everyday shuffle. In the world of comedy, the traps of type casting can be easy to fall into and for most performers the greatest risk is to not fall into one of these holes. The list of comedic performers that have broken out and taken a dramatic risk have grown over the past few years, with a lot of big screen success and Sarah Silverman will soon add her name to that list. Sarah Silverman stars in the upcoming drama “I Smile Back” and plays Laney Brooks. Laney is a mother and wife that travels a road of destruction, in which her vices are leading to an end of her “loving” family. As the end looms before her, Laney must take a final chance at redemption. As you can tell by this trailer, this movie is coming out of left field for Silverman and this should not be a surprise. In her career, Sarah has attempt very different roles and genres to the enjoyment of most viewers. Also, she has seem to make it a point to not be trapped in a type casting situation and challenge herself as a performer. In this role of Laney, I will bet good money that she will be making the awards circuit in the upcoming year. “I Smile Back” will be released on October 23rd.